LOve the OTP styling especially GHJ(dare to go unique) and JRW (yC style head to toe). p/s : sorry i can't upload the Video WVM got some probs hopefully others can upload it! Lee Bum Soo, who showcased his delightful charisma in his role as Yoo Bang in the recently ended SBS drama History of Salaryman, will return as a top secret researcher in the movie Comeback. Lee was at the premiere of Comeback at a CGV in Wangsimni on March 19 and showed a different type of appeal from the one he showed as Yoo Bang in his new role as Baek Hyun Chul in the upcoming movie. 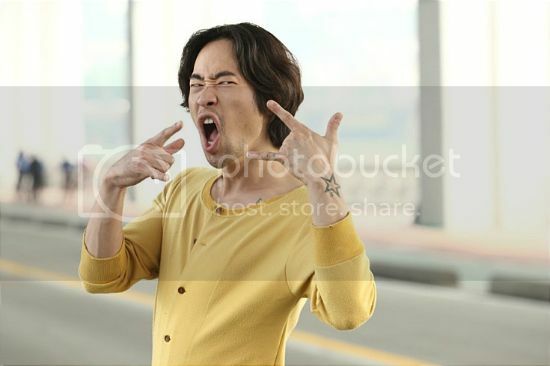 Although Lee was able to show off his slapstick comedy routine through his role as Yoo Bang, he won’t be able to continue the slapstick humor. Instead the comedy will be carried by the humor arising from the different scenarios in the movie scenes. Moreover, the comic releif, An Jin Oh, will be played by Ryu Seung Bum. Lee’s Baek Hyun Chul character is a top secret researcher who is trying to find a corpse that holds a deeper secret with the help of Han Dong Hwa (played by Kim Ok Bin), the daughter of a fellow researcher. The stubborn character, An Jin Oh (played by Ryu Seung Bum), will provide comic relief and bring out the laughter from the audience. Director Woo Sun Ho is making his feature film debut with Comeback. In 2005, Woo showed his directing talents when he received the Best Picture Award for King of Comedy at the Mise-en-Scene Short Film Festival. Comeback will be released in theaters on March 29, and is recommended for viewers 15 years and older. Reach reporter Oh MiJung on Twitter @isyutar! Actor Ryu Seung Bum showed off his dorky side in Comeback. Ryu, who plays the role of An Jin Oh, a character who fakes his own death to get his own insurance money, joined his co-stars for the press premiere of Comeback at a CGV in Wangsimni on March 19, to discuss his role. Ryu said, “I was able to properly show my dorky side through this film. There were even times when I thought to myself ‘Is it okay to act like this?′"
But Ryu’s clumsy acting will be sure to provide the main comic relief throughout the movie. In Comeback, two top secret researchers are trying to find a missing corpse. The cast includes Ryu Seung Bum, Lee Bum Soo and Kim Ok Bin. Has Kim Ok Bin decided to be more feminine? On March 19, badass actress Kim Ok Bin was spotted alongside Lee Bum Soo and Ryu Seung Bum to promote their new movie, Comeback. Though she kept her signture bob, Kim cast aside her punkrock image and donned a cute marine-look inspired dress, complete with sunflower buttons and all. We love the badass, motorcycle riding Kim Ok Bin, but we′re digging this look just as much! Comeback portrays the crime and fraud that takes place among the characters as they try to take a body for ulterior motives. The film will be released on March 29. To see more photos from the press conference, click here. Today is D' Day ahh hopefully everything is gonna be smooth! 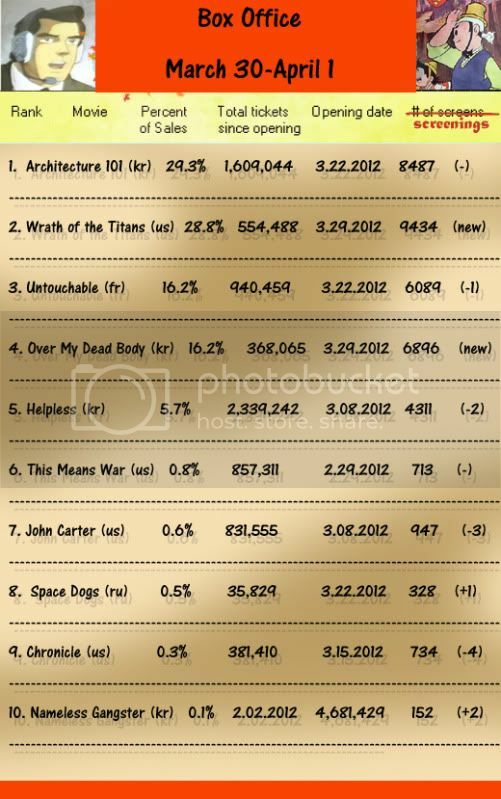 Movie "Over my Dead Body" rose to top 3 in the box office at the same time it was released. According to the Korean Films Commission on the 30th, "Over my Dead Body" rated top three in the box office with a total of 55,130 spectators in 402 theaters. "Over my Dead Body" is a criminal movie about the things that happen between the characters over a 'dead body'. The movie's fresh subject material and witty lines with crazy characters like Ryoo Seung-beom, Lee Beom-soo and Kim Ok-bin seem to blend in well with each other. Other characters include Ko Chang-seok, Oh Jeong-se, Bae Jeong-nam, Yoo Da-in and more. The first place of the box office went to "Architecture 101" which drew in 75, 262 audiences in 463 theaters. 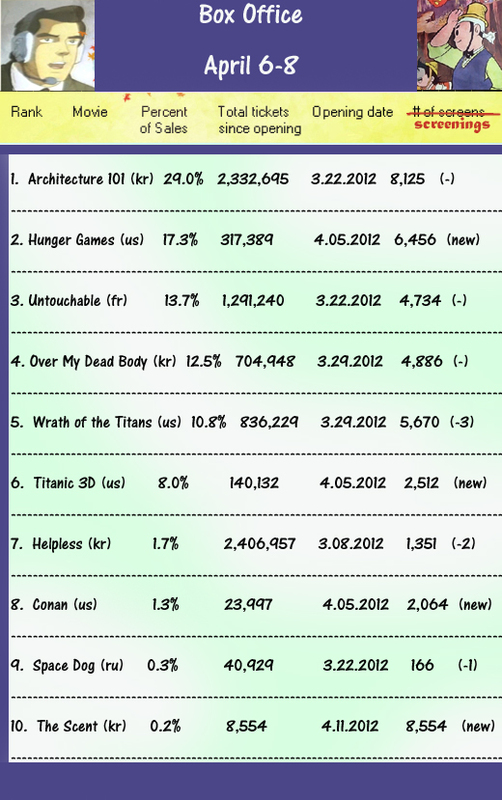 The accumulated number is 1,038,032 and "Wrath of the Titans" came in second with 71,558 and "The Intouchables" came in fourth with 40,239. Kim Ok Bin was very outspoken. She didn’t say much, but her actions showed that she wasn’t hesitant in voicing her opinion. When she previously revealed her relationship with Heo Jae Hoon, member of rock band Schizo, she openly kissed him on the stage of a rock festival. Kim Ok Bin said that she just keeps her face bare everywhere she goes. “At first people used to tell my manager that they had seen me, but now they don’t,” she laughed. Comeback is a comedy film about people who try to nab a body that has a chip embedded in it containing industry secrets. Kim Ok Bin took on the role of Dong Hwa, who jumps up to act even before she says anything to anyone. Lee Bum Soo will be appearing as the elite researcher Hyun Chul, while Ryu Seung Bum will be playing the role of the crazy Ahn Jin Oh. How do you think ‘Comeback’ turned out? The pink hair you don in the film is very impressive. I don’t think it would’ve been easy to take care of. You must’ve gotten a lot of pink-hair-related nicknames. The director for this film, Woo Sun Ho, is new to the scene. You starred in director Park Chan Wook’s film ‘Thirst’ before; how was your teamwork with director Woo? Was there anything director Woo specifically asked for? Did any of your ad-libs make it into the film? Do you like comedy films? How do you think this film will do? You’re much younger than your partner Lee Bum Soo. You’re 17 years apart. In the film ‘Thirst’ you acted with Song Gang Ho, who is 20 years older than you, and Shin Ha Kyun, who is 13 years older. You acted with great actors such as Lee Bum Soo and Ryu Seung Bum. How was it? Perhaps it’s because you’re smart? You come out with a rock style in the film, too. Don’t you think you’re showing you like rock a little too much? Your boyfriend is the member of a rock band also. Dong Hwa, Kim Ok Bin’s role, acts before she thinks. Did you understand her a lot? What did your boyfriend say after watching the film? Kim Ok Bin appears in difficult films. Is there a reason for that? Have you ever wanted to become a hallyu star? Your charm is that you don’t act like a celebrity. You called yourself an uneven actress. Why is that? You’re also famous as a star that has never had plastic surgery. What do you think about plastic surgery? What film did you watch recently? Have you made any promises related to the film’s success? What kind of actress do you want to be? What kind of piece is ‘Comeback’ to Kim Ok Bin? What does a fun and lively shooting site mean for Lee Beom-soo? In an interview with OSEN along with the release of the movie "Over my Dead Body", when Lee Beom-soo was asked who he thought was a good atmosphere maker during the movie shoot, he thought about it for a while and started talking carefully about his ideas of a fun person on set. He said, "There needs to be a right mind of thought here. Someone who doesn't do what he or she has to do but just goes around having fun is just thoughtless". He continued, "You must be able to concentrate and put in effort and passion in his or her work. If you don't, you just become an act up and no one likes that". "When the crew and staff are all tired and worn out, this 'maker needs to have the ability to gather up an energetic atmosphere and be able to get dinner or something for these people one day. It is also most important for them to be able to listen to an hear out any troubles or worries our juniors have as well". "The important thing is, this is work so I am alert at the fact that the set is lively and fun. I keep a strict watch for anything fun. I think it's good to have a serious attitude on set". He then said that a fun shooting should be made and only made through acting. "Of course the set has to be fun. Publicly. When a group of neighborhood friends want to have fun, they mean getting sweaty and pushing each other around. However, dumb people think about coming out with their slippers and cell phones and just jogging here and there to kick the ball around a little bit. Making the set fun is when everyone gets together to make ideas, good scenes and feeling excitement through the process. I call that a fun shooting site. Act ups only know how to laugh about something that happened yesterday. That is not work, that is not a joke and it's just rubbish". About the "Over my Dead Body" site, he said, "There was intensity, joy and happiness. That's why I want to work with them again and again. That is a truly fun movie site". "Over my Dead Body" is a comic fraud movie about people who want a body for different purposes. Lee Beom-soo is an elite researcher who puts down the weight in the movie and acts with Ryoo Seung-beom and Kim Ok-bin. Woaaa .... I want 2 watch the movie. You know, I wondered why I kept seeing pictures of Ryu Seung-beom running around shoeless wearing nothing but a yellow pajama onesie like a crazy person. I’m pretty sure I don’t even need to know what this movie’s about, because you had me at Ryu Seung-beom in a onesie. Here’s a sneak peek at his latest film with Lee Beom-soo (History of the Salaryman) and Kim Ok-bin (The Front Line, Thirst) called Over My Dead Body, or the more literal title, The Corpse is Back. It’s a comedy heist film produced by Cine 2000 and directed by Woo Sun-ho, about three thieves who are all after the same corpse, presumably because Dead Guy kept a lot of expensive secrets, or perhaps a treasure map on his person at all times. Ryu Seung-beom plays a con man whose penchant for lying and cheating is innate. Lee Beom-soo is the brains of the operation, a rational and meticulous researcher. Kim Ok-bin’s character is described as acting before speaking, so maybe she’s the badass. The three have nothing in common, except for the fact that they each want this dead body, so they plan a heist, and well, things just go horribly awry. Thus begins the wild goose chase. I’m definitely in the mood for an all-out comedy with wacky characters and ridiculous situations, and it’s nice to be able to see Lee Beom-soo so soon after Salaryman in another hilarious role. Keep ‘em coming, I say. CJ Entertainment’s distributing the film, and the trailer’s already got subs, so there’s a good chance it’ll hit stateside. Over My Dead Body is in theaters in Korea now.